Commissioned by Museo Rufino Tamayo for the group exhibition, Olinka, or Where the Movement Is Created, curated by Adam Szymczyk and Magnolia de la Garza, Museo Tamayo 11 December 2012-15 April 2013. There were four related works produced for the exhibition and made in collaboration with David Harding. 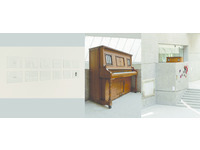 They have the collective title Quartet, but this includes the film installation, titled Quartet, the two part work Olinka Variations (prints and pianola scroll with player piano installation by Ross Birrell), and Dr Atl's Olinka: Notes towards a film (a text publication by David Harding). 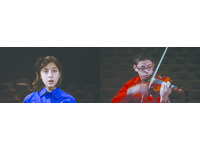 Quartet is a single-channel film installation consisting of a single-take tracking shot of recitals of two pieces of music performed by members of the Orquestra Esperanza Azteca de Ciudad Juarez. The music is Madre, la de los primores - a previously unrecorded choral work for 4 voices by Juana Inés de la Cruz (1648-1695) - performed by 4 female members of the orchestra choir and 'Il Terremoto' (The Earthquake), the final movement of Haydn's The Last Seven Words of Christ (1786) performed by a string quartet consisting of 4 male members of the orchestra. Quartet was filmed in the Centro Cultural Paso Del Norte. The Esperanza Azteca orchestra formed in 2009 in Juarez - the most violent city in the world - and the desire to work with this orchestra and with the specific pieces of music was a response to the violence against women which had taken place in Juarez since the mid-1990s and detailed in fictional form in Ch. 4 of Roberto Bolanos 2666. The film installation featuring the only extant music by Sor Juana, a celebrated female figure in Mexican history, performed by female choristers of the orchestra is an act of resistance to the brutality of living conditions and continued violence against women. However, the precarity of such acts of resistance and the ever present threat of violence is registered in the second recital, 'Il Terremoto', 'The Earthquake', from Haydn's Last Seven Words of Christ by a string quartet composed of four male orchestra members, the final movement of the work following the death of christ and his words: 'My Lord Why Hast Thou Forsaken Me'. The conflict between 'female emancipation' and 'male aggression' is both sustained (both aurally in the tension of the contrast between the performances and visually in the blue and red shirts worn by the female choristers and male musicians, respectively) and resolved in the shared endeavour to produce a virtuoso musical performance - an act in sympathy with the Esperanza Azteca to offer a generation of youth an alternative to the violence which surrounds and scars their daily lives. 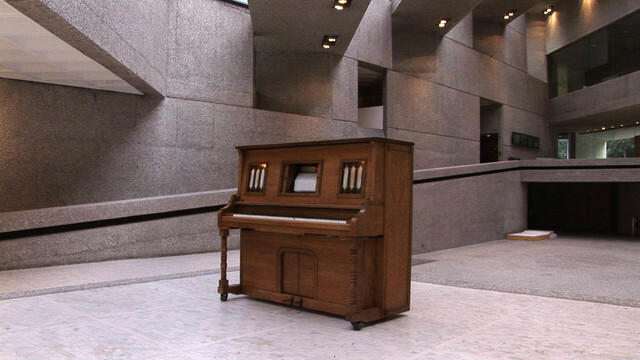 Olinka Variations is a work in 2 parts, a pianola scroll of a 12 tone composition based upon the name of Carmen Mondragon (aka Nahui Olin), a female poet in the 1930s and central figure in the exhibition context. The score is imagined as a 'lost composition' by Nahui Olin, who was also reported to have composed at her piano in the 1930s (although no actual scores survive) and evolved as a fusion of aesthetic and political contexts of two development in avant-garde music: the atonality or 'emancipation of dissonance' of Schoenberg's 12-tone system developed in the 1930s and the works for pianola by communist US composer Conlon Nancarrow, who emigrated to Mexico City in the 1950s and whose centenery was celebrated in 2012, the year of the exhibition. A research visit in October 2012 to visit Nancarrow's archive held in the Paul Sacher Foundation in Basel was supported by Kunsthalle Basel. 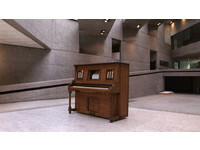 Olinka Variations was exhibited as a set of 12 digital prints and a pianola scroll as an audio installation for player piano. The final part of Quartet is Dr. Atl's Olinka: Notes towards a film, a book with writings by David Harding, conceived, designed and edited by Ross Birrell which reflected upon the planned utopian city of Olinka by Mexican painter, Dr Atl (lover of Nahui Olin) with paragraphs on the contemporary locations in Mexico where it was suggested Olinka could have been built. In the final paragraph, Atl's utopia Olinka is transposed to present day Ciudad Juarez, the most violent city in the world. Olinka Variations and Dr Atl's Olinka: Notes towards a film were conceived as the score and script for an unmade film about an unrealized utopia. In April 2013 a film was made of Olinka Variations shot in Museo Tamayo and screened at Mount Analogue, Stockholm at the invitation of Tris Vonna-Michell and supported by the Royal Institute of Art, Stockholm.